Haldi patra pitha for bengalis, patholi for Konkanis and patole for Maharashtrians, this wonderfully aromatic steamed sweet stuffed dumpling is something that definitely evolved in the oriental-tropical world. 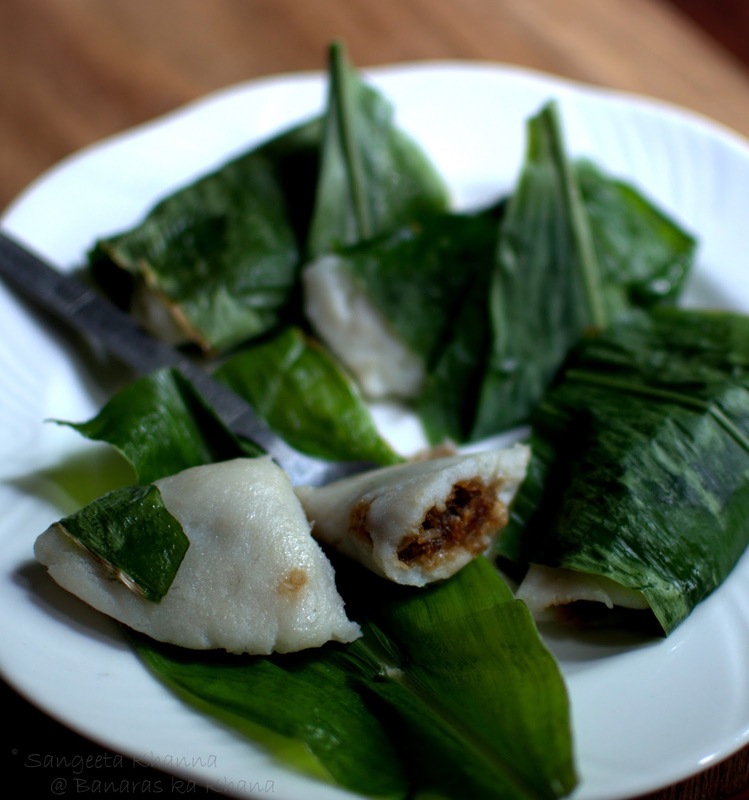 You would see a Kaa noom sword side in Thailand which is another variation of the same rice dumpling. How food connects the world. Steamed desserts have a certain charm to them. 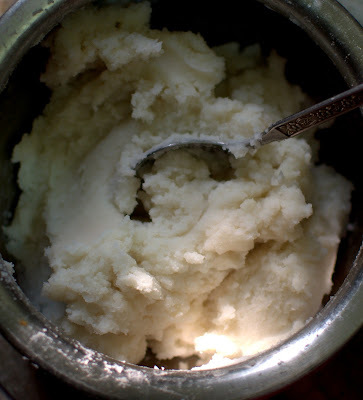 Especially if the steamed desserts are made of rice with a coconut and jaggery stuffing. I don't know if you have tried any of those modaks and pithas but I took to them like fish takes to water as soon I got introduced to these sweet nothings. These were not made at my mother's place although a steamed round modak was made occasionally. I learnt this turmeric leaf wrapped modak or pitha on Sanjeev Kapoor's show more than a decade ago and steamed this aromatic treat the same day. There have been many repeats since then. That I grow turmeric in my garden helps, else you would have to get hold of some turmeric leaves if you want this subtle aroma. This year interestingly, I couldn't replant my turmeric tubers and was missing having them. So when I saw turmeric growing in the backyard of a friend's place I immediately got a few for myself. That greedy for food I am. Made these the very next day. 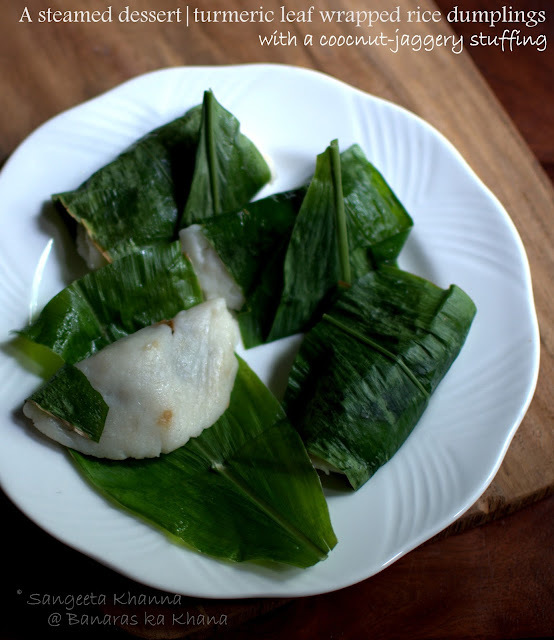 The recipe is simple and you can make this dumpling by using raw rice paste as this patole recipe, but I made it with a cooked rice dough because I wanted the taste of ukdiche modak redolent with the aroma of turmeric leaves. And that's what I did. 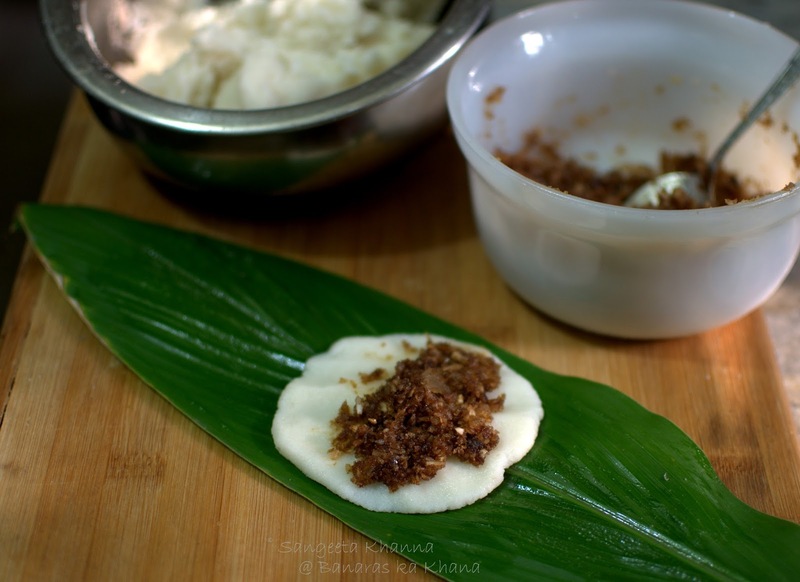 To make the rice flour dumpling this way.. Cook the rice flour with twice the amount of water. 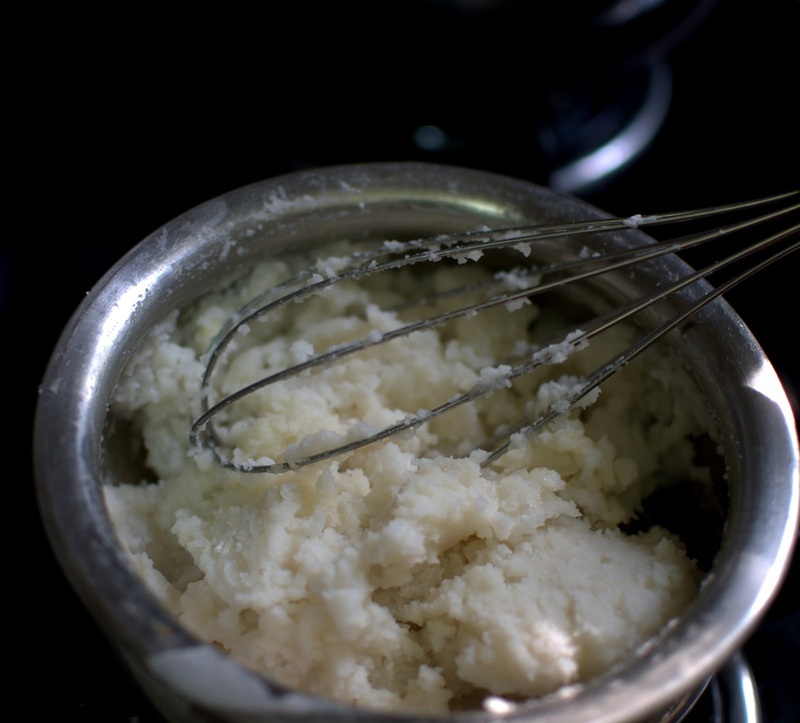 For a cup of rice flour you need 2 cups of water and 1/2 tsp salt. Boil the water and salt in a pan and dump the rice flour at once into it as soon as the water starts boiling. DO NOT stir, cover the pot and let it simmer for 3-4 minutes. Take the pan off heat, open the lid and holding the pan with a mitten clad left hand, whisk the rice flour vigorously with right hand. The whole process takes about 10 minutes for this quantity. Use a wire whisk for convenience. Now mix this lumpy dough with the help of a sturdy spatula or spoon, till the mixture becomes smooth and looks like a malleable dough. You would be able to make small balls out of it as soon as it is colder. You can make the stuffing in the meantime. Half a fresh coconut peeled, sliced and coarsely shredded in food processor, added with jaggery to taste is cooked till everything incorporates together. I microwaved it for 2 minutes. And I used a raw rich brown sugar which made my work easy. Now spread the clean turmeric leaves, grease them with ghee and flatten a rice dough ball over it. 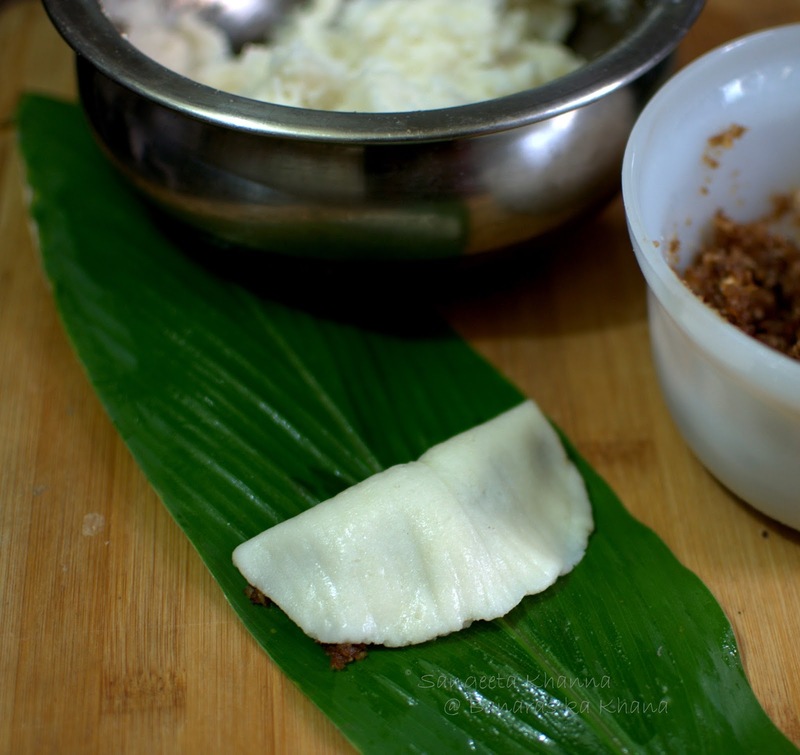 Place a generous amount of coconut jaggery mix over it and fold it nicely so the dumpling becomes half moon shape. A little bit of leaked stuffing is not a problem, as the turmeric leaf is going to wrap around the dumpling. Shape and wrap all dumplings and place them all on a ghee greased plate. I used a ceramic plate as I was microwaving them all together. You can use a perforated steel plate if you are steaming the dumplings in steamer. It needs to be microwaved covered so I normally cover the plate with an inverted bowl. These required a 5 minute microwaving time. Just go by how many or how big your dumplings are, and a little raw dumplings wont be a problem since everything is cooked anyways. But steaming them for some time helps the dumpling to hold better. The rice starches settle down to hold the stuffing better and you can pick up the patholi or pitha in your hands to have a bite. This was heavenly. The turmeric leaf marks look really gorgeous. How simple cooking techniques can make food so exotic, I wonder how our ancestors experimented with simple ingredients to cook such wonderful food. The slightly salted rice dumpling with a rich sweetness of jaggery and aroma and taste of coconut is something that satiates the senses immensely. Please note that a modern baked dessert with all the butter, sugar and flour would NOT make you feel sated, it would make you want another sweet once the multiple helping dessert is over. With these modaks, you eat many of them and feel blissfully sated. And do not crave for more sweet once they are over. There is a reason for it. Real food makes your system behave well. PS : Note that the turmeric leaves need to be cleaned really well, soak them, rinse them and wipe the leaves both sides with a clean muslin twice. The urban dust on them is not easy to get rid of. Mmmmmmmm! I am walking over for some. Lovely recipe. I realize what you say about real food being better for the system. 15 days of stay with my parents,I ate all the food - rice , sambar etc that I had grown up eating and understood how well it suited my system. Did not put on a gram, on the contrary I lost weight inspite of ocassionally indulging on payasam. I did not feel bloated and was feel light and wonderful. I experience true state of bliss - food wise and otherwise too. I am so glad you could connect to the recipe as well as the thought. Real food is the only way to go, we need to rewire the food industry isn't it? Ah brings back memories..:) Though I make this often but yet what I find amazing about this particular recipe is its adaptability in all parts of India...!! 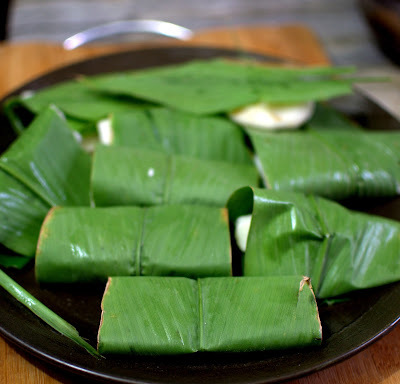 As in the earlier review I too was reminded of the " ada" Keralites make.. similar but in banana leaves.. and it has to be had hot with the scent of warm banana leaves. To each his own..!! Was in Dhaka for a while and was amazed at how "pithas" are revered there! In the morning you have thelawalas selling them on roadsides as breakfast snacks..! !And they have developed quite a range of it even steaming them in coconut shells! I am making that ada very soon Sunita, have some banana leaves hanging towards my part of the backyard from my neighbor's garden. 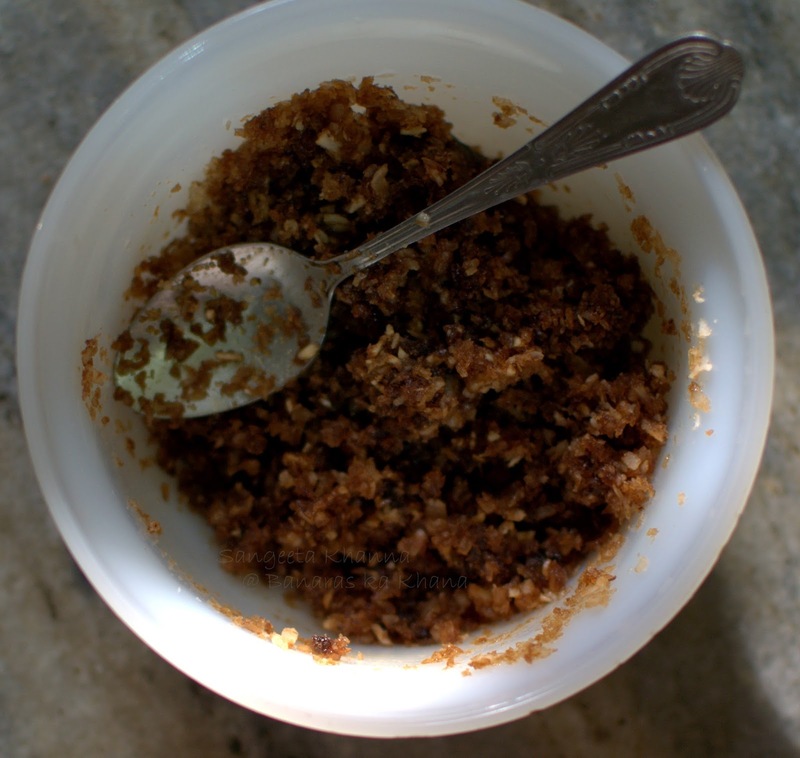 And yes, I know how bengalis make several versions of this sweet treat. 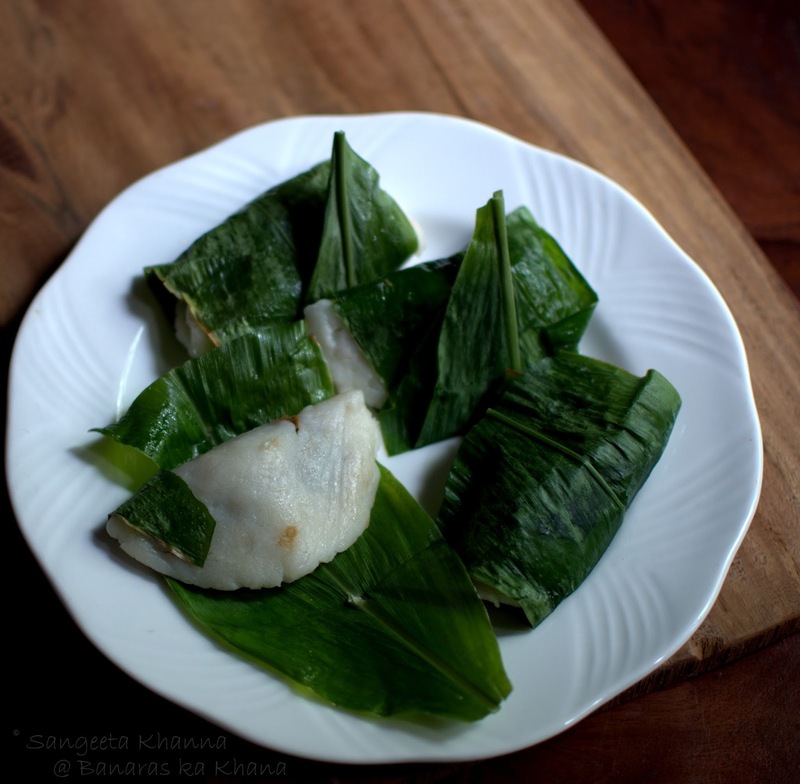 One of those coconut shell steamed pitha with a drizzle of date molasses is the ultimate.